Like the sun in the coldest winter, Dr. King’s dream shines on. Dr. King’s words continue to inspire us because his message was timeless. In the face of centuries of oppression and injustice, he urged his listeners toward the higher ground of perseverance, nonviolence, determination, faith and hope. Though his speech will forever be linked to that August day in 1963, the principles he describes transcend the immediate context to resonate today in countless ways. May his resolve bring you renewed belief in your own ability to defeat despair. Wow, that was a photo worth waiting for! (Probably a chilly wait, too!) 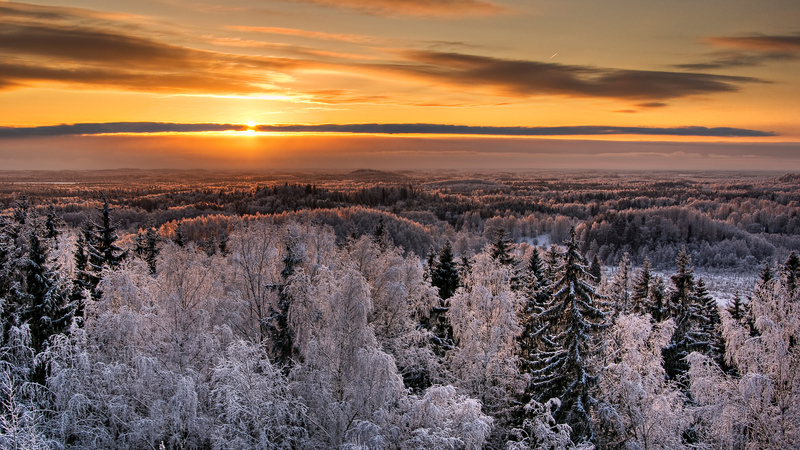 And a view I’ll probably never personally experience, having been taken in Estonia. Dr. King’s vision has been a long time coming, too, and he only experienced it personally in his imagination. But what a vision it was, and what a blessing to the rest of us, that he shared his vision with us. A new day dawning on this dark, cold world! Today, I plan to celebrate that vision, in whatever small glimpses of the light I see it. Susan, your words about “whatever small glimpses” have prompted me to post here my personal favorite words of Dr. King. The beautiful “I have a dream” speech will be played over and over again today, but the one I remember most is the final speech he ever made, the day before he was killed in Memphis. His prophetic closing words bring tears to my eyes. If possible, I encourage everyone to watch at least the closing words of this stirring speech; the full text is posted at the link above, and the video of the closing moments can be seen at about 1:20 into this You Tube link. 🙂 ❤ Those words give me courage every time I hear them. Amen! Good morning Julia on this beautiful MLK birthday!! I will remember his beautiful thought provoking words today and all month. He wanted to bring all God’s children together. I pray one day his dream is realized. Hope this morning finds you and the “boys” healthy and happy. I miss my daily dose of defeat despair and am making do with Monday and Thursday’s. Thank you, Cherie. We are doing pretty well, enjoying some sunshine today despite cold temperatures. I appreciate your saying you miss the daily blog. I miss it too, but now I wonder what become of all the time I thought I would have when I cut back to twice weekly. It’s amazing how time just seems to vanish. We are getting a few long-overdue projects done, little by little, and Jeff is feeling well now that he’s been off chemo awhile (but he will likely be starting back on it soon). Love and prayers to you too! Thank you for the reminder to look beyond circumstances to a better way to think & live. Dr. King continues to inspire us to be kind to all people & do something NOW for anyone you can. Do not wait for a plan, a program, a project; just go about your daily life, always aware that someone can use YOUR help & then give it. Glad to hear “my” Dentons are okay. 🙂 Love you bunches! It does, doesn’t it? I’m glad you like it. Thank you, Mary Ann. I so appreciate the way you have lived up to these words. Well over 99% of the people I know seem to feel that there are community agencies and governmental departments in charge of caring about people with disabilities, a “task” they gladly delegate. You are an exception, and were from the first day we met you. Thank you for caring so much about so many! Julia, I just read a phrase yesterday that really was quite meaningful and also appropriate for your blog today. “Going from despair to hope while praising God and choosing contentment during trials” from the cover of WHILE I’M WAITING, a 31 day devotional by Laura Hodges Poole. I agree that Dr. King’s speech was an inspiration and certainly timeless. Thank you for the special blog today! Sheila, you’re welcome! Thanks for being here and for sharing your encouraging thoughts. We need that voice today. Alan, oh how we do need that voice today. I was just thinking the same thing myself. At least his great speeches live on in the archives of history. 1. she is too far away for me to visit plus she has a doting husband who will care for her. Can you think of anything I can send or do for her that would be appreciated by a chemo patient? 2. Tomorrow her treatment is all day, the next two days are half days. Will she feel up to a phone call while the treatments are going on or should I wait to call until later in the week? Any tips on being a supportive sister would be appreciated. Everyone is different, in terms of what they find encouraging or helpful during cancer treatment. Jeff is a tough guy who seldom shows emotion and doesn’t ever want any help, but I can tell he is touched by the cards and prayers from people who obviously care about him. He would NOT want a phone call, but many people (women especially) might like one. As far as whether she will feel up to anything during and/or after the treatments, that too varies tremendously. I do know that the side effects of chemo are treated much more effectively than they used to be, so that many people are able to go about a fairly normal life while taking chemo. Though this advice (sadly) is coming too late, I would say talk to you sister directly (via phone or written note) and ask her what she would prefer. Cards are nice in that they can be seen whenever the person feels up to seeing them, but phone messages serve much the same purpose now, assuming your sister is comfortable with not answering the phone if she doesn’t feel like talking. What Jeff and I have most needed, and haven’t had for the most part, is practical help, which in our case translates to people willing to come and take care of Matt and be with him for us during the many medical demands that have arisen all this time. Sadly, despite the great strides being made by people with developmental disabilities, the world at large (and people close up) remain unwilling to really be close to a person with such needs. There are a few exceptions; Drew has been our most constant support, even with a new baby and despite his having to postpone his dissertation to spend extended time with us; my sister has used her limited personal vacation days to spend weeks with us during surgery several times, and my friend Peggy traveled from the Gulf Coast of Mississippi to stay with Matt for ten days. Darla has been a continual presence in Matt’s life, taking him on outings and to activities with various social groups, which has given him a bright spot in his life. But as Raynard says, I digress…what I started out to say is that, if your sister has any practical needs (pet sitting, plant watering, house cleaning, meals cooked, etc.) those would be great ways to help; unfortunately, if you are geographically distant from her, you couldn’t do any of these things yourself, and hopefully she has others who can do them (though we can never assume such). Perhaps you could offer to be the contact person to keep friends and relatives informed for her, if she gets tired of doing that, since that is something that could be done from a distance. In any case, the most important thing is for her to know you are there for her if she needs to talk or if you can help in any other way. My sister and I have an agreement: she told me she will get on a plane anytime at short notice if I really need her, and I have promised her that in a drastic emergency, I would know that I can call on her. My friend Amy, who lives less than an hour away, also has that same agreement with me: she will be there for me anytime I need her (as she was the night Jeff was first diagnosed and taken into surgery, when she and Steve came at a late hour to stay overnight with Matt). That helps a lot though I hope and pray I will never have to call on these loving ladies. Thanks for caring about your sister. Genuine concern is the most important gift we can give. Again, I am sorry for the long, long delay in answering this comment. Thank you for your wonderful answer. I was not worried about the delay because I knew you were taking time off from the computer. I’ve thought a lot about your comments on practical help and trying to be better at that with local friends. Thanks for your comments and for caring. Ann, those socks and the Vicks sounds like a great combo! Makes me want to shut down the computer and head right for the bathtub and then bedtime (with socks of course). It sounds as if you are walking the fine line very well. I hope your sister doesn’t have a lot of neuropathy but it got really bad for Jeff. The second course of chemo he started taking the Neurontin from the beginning and that helped a lot. Some chemo drugs are worse about it than others but supposedly the combination Jeff has been on (FOLFIRI) is one of the less severe ones from that standpoint. Unfortunately the tiredness tends to build or at least remain throughout the treatment. I need to take my own advice about being helpful to others locally. Since Jeff’s diagnosis I’ve sort of given myself a pass because we are dealing with so much. But I know that helping people in everyday ways can be very therapeutic. Hope you have a lovely weekend ahead. Hello from a nice cool evening . Today has been good for MLK day,sweater day but our temps are going down again. I can handle the cold temps as long as the sun is out. Up date on me. I have new glasses and it is wonderful to have NO more double vision, of course, I will always have it in the reading vision when I don’t have them on. I am feeling good and pray that I have a great 2015. I pray that you all are well. I did read that Jeff may start chemo again,he is I my prayers for healing. We are going on our third year. Better clse, love you all and I’m sending hugs . Hi Carolyn, I am SO happy to hear about your glasses!! I just wrote a post about eyesight the other day (which is for later). As I was writing it, I was thinking of you and all the recent problems with vision you have had. Jeff will be meeting with his oncologist in a few weeks to decide what to do next. The NIH/NCI Phase I protocol is just a bit too untested for us right now – exciting but risky and the doses are still low while the safety profile is being established. He won’t be able to do anything until this internal abscess heals. It’s still draining and the surgeon said it could take months. As always he is soldiering on and amazes me more each day that passes. I am so proud of both of you. YES you are both into year three! More than halfway to the five-year celebration. Take care and have a wonderful February. Love to you and Terry. Beautiful! He was a remarkable man. We need more men and women just like him. Thanks for your words and deeds, Julia. Alys, you are welcome. We do need more like him, now more than ever. Raynard, I haven’t yet seen the King Memorial now that it’s finished. I plan to go there this spring with visitors. I will keep you and your wife and her aunt in my prayers and maybe this year we will be able to get together. Let me know when you head down to Virginia Beach. I will be taking Matt down there for a doctor’s appointment in February. We are all doing OK and hope you are too. Thanks for being here! Raynard, I am so happy to learn this about your family. I have been so grateful over the years to those people who are gifted with the ability to see past people’s differences, and are willing work with and for them. It is certainly a calling that not enough people have, one that will be more and more needed in our world as medical advances make extended life possible despite chronic illness and disability. All of us will need this gift of service, for ourselves or someone we love, at some point in our lives. Those who are willing to serve in this way deserve our highest respect and honor.